The New Brunswick Community Farmers Market, in cooperation with the Rutgers Department of Human Ecology launched a program this summer that brings fresh, locally sourced produce to residents benefited by Meals on Wheels in Greater New Brunswick. The three organizations work together to stuff and deliver bags full of fresh fruits and vegetables like blueberries, peaches, cherries, bananas, grapes, summer squash, broccoli, tomatoes and cucumber. These parcels go out to approximately 60 senior citizens in New Brunswick and Highland Park. According to organizers, research has shown that many home bound Meals on Wheels clients lack fresh produce in their homes and are further hindered by their health or financial situations. Regular deliveries of fresh fruits and vegetables will help benefit the help of these clients. 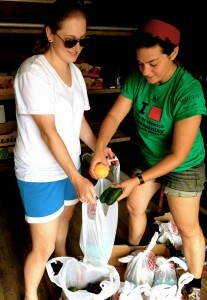 Each delivery contains about $7 worth of produce, with drop-offs made every other week, for a total of four deliveries throughout the summer. For more information about the New Brunswick Community Farmers Market, visit www.nbcfarmersmarket.com.